Although the Nantasket Beach strip is a pale reflection of its glory days as Paragon (amusement) Park, a whiff of the traveling carny still flavors the narrow stretch of old arcades and summer buildings that fronts the beach. Just north of the carousel, among the many faded facades, a colorful stretch is developing where you will find a bright yellow beach shack with surprisingly good food. Hull’s Kitchen was opened by husband and wife Jane and Jeff Wicks of Scituate in 2006, in an abandoned building that used to house Stuff It, a roll-up sandwich takeout place (which had a thriving branch in Cambridge for many years). The Wicks renovated the building, installed deck tables, got themselves a liquor license, and devised a small, smart menu. Last year, the couple expanded the porch, doubling the outside seating to 36 and creating room for live music on weekends. 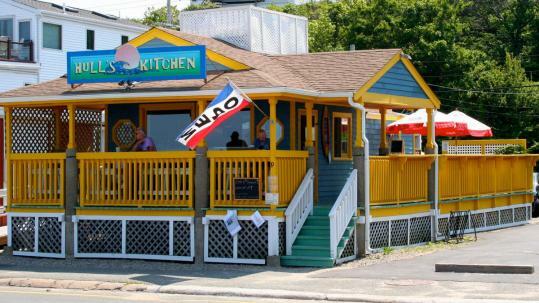 Hull’s Kitchen has the requisite beachy fried fish done very nicely, but it also has grilled fish; good salads with add-ons; grilled, hot, and cold sandwiches; roll-ups; fabulous New England clam chowder ($4.75); and various daily specials. The little beach shack also serves a variety of mixed and frozen drinks as well as beer and wine. We’ve been enjoying their fish and chips ($11) every summer for a few. The batter is light and nicely seasoned, which flavors the fish inside. I was surprised by how good it was when I first ordered it, and it has since become my go-to fish and chips when the season hits and nothing else will do. Equally unexpected is the thoughtful inclusion on the menu of a large portion of hummus, dotted with kalamata olives and olive oil, served with wedges of warm Syrian bread, for $5. I love being able to get a vegetarian, low-fat protein for a low price at the beach. A frequent guest on the specials menu is a Caesar salad with grilled salmon ($15). I’ve had this twice. It is a simple romaine, lightly dressed, topped with a lovely, large salmon filet. The HK salad ($9) is a satisfying mix of romaine, cherry tomatoes, goat cheese, chickpeas, kalamata olives, and cucumbers, with an exceedingly light, house-made dressing — hardly there, actually. You may want to ask for a wedge of lemon to perk it up a bit, but I far prefer this light dressing to a commercial one packed with additives and bottled flavor. The salad becomes a terrific meal with the addition of grilled shrimp, chicken, or scallops (add $7.50), which were so delicious one night, I ordered them again the next. The fried scallops ($13.50) are fantastic, but are so good they don’t need to be fried to be a special treat. The grilled turkey, roasted red peppers, and goat cheese panino is nice ($9), and roll-ups can be customized from a base that includes meat, cheese, lettuce, and tomato ($6), with a range of add-ons that include avocado, hummus, mozzarella, and goat cheese. The grilled portabella ($9.25) mushroom sandwich needed seasoning the day I had it, although it was overflowing with mushrooms and grilled onions. I wasn’t crazy about the mussels in butter and wine special ($12), although the grilled bread that sided them was full-bodied and bit back (which is a bread you have to love). I wish the smoothies were all fruit, but the banana strawberry has some kind of added sweetness that is too sweet. But, no problem: I go to Hull’s Kitchen for good, simple, flavorful food cooked with care.